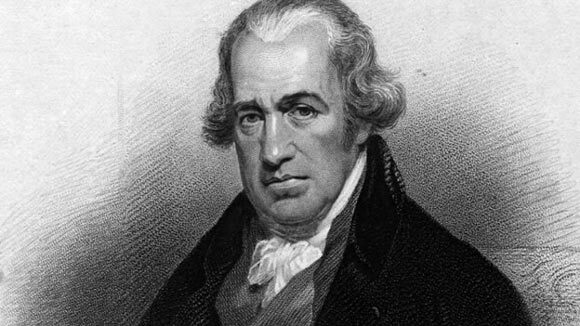 James Watt was a Scottish inventor, best known for improvements made to the Newcomen steam engine invented by Thomas Newcomen in 1712. Watt was one of eight children born to James and Agnes Watt on January 19, 1736. James Sr. was a shipwright and successful merchant, whereas Agnes came from a distinguished family and was well educated. Watt was initially taught at home by his mother, and then attended Greenock Grammar School. He showed a marked aptitude for mathematics and engineering, but little for Greek or Latin. He was a sickly child, and often suffered from acute headaches. His parents were both religious, but he turned to deism in later life and shunned organized religion. He was first married to his cousin Margaret Miller in 1764 (who died in 1772), with whom he had five children of whom two survived. Watt remarried in 1777 to Ann MacGregor, with whom he had two children. At the age of 19, Watt moved to London to study instrument making, and then returned to Glasgow, Scotland to set up his own instrument making business. He was not very successful at first because the Glasgow Guild of Hammermen rejected his application to set up a business as he had not completed the mandatory seven year training as an apprentice. He then began to work as an instrument repairman at the at the University of Glasgow, and set up a small workshop within the university. Because he was extremely proficient with instruments, there was plenty of demand for his work. He made friends with prominent professors including the renowned economist Adam Smith and physicist Joseph Black. In 1759, he set up a partnership to manufacture musical instruments and toys. In 1763, the University of Glasgow received a Newcomen steam engine that had malfunctioned, which Watt was asked to repair. While doing so, Watt noticed that the engine used too much power and decided to try and improve its efficiency. He worked on this idea for many months and eventually came up with a solution that he thought would work. However, he lacked the financial backing and so he took on a business partner for the intended project. His partner, John Roebuck, held two-thirds of the patent but later ran into financial difficulties. Roebuck’s stake was then bought out by Matthew Boulton. Boulton and Watt continued to manufacture and sell Watt’s improved steam engines. They were popular because they provided four times as much power than Newcomen’s design. Their main customers were colliery owners who used the engines to pump water from their mines. Another one of Watt’s famous inventions is the rotary motion steam engine, which could be used with many different types of machinery such as textile, manufacturing etc. In 1775, Boulton and Watt were granted a patent by the British parliament granting them exclusive rights for manufacturing and selling steam engines. The engine’s popularity began to rise and by 1800 there were more than 500 engines in use in factories all over Britain. James Watt was a member of the “Lunar Society of Birmingham” which was a group that met to dine and converse on the night of the full moon. It had a number of notable members including Matthew Boulton, Joseph Priestley, Thomas Day and Erasmus Darwin. Watt was also responsible for coining the term “horsepower” by comparing the efficiency of his machines with a team of horses. He retired from business in 1800, the year in which the partnership contract with Boulton expired. The business was then handed over to both men’s sons. Watt died in 1819, having received various honors including being a fellow of the Royal Society of Edinburgh, being elected to an elite group called the Smeatonian Society of Civil Engineers in 1789, and the unit of power “watt” being named in his honor.